Discovering how our protagonists link together presents a quest-like element, as each story immerses us in the concerns of a single, stand-alone character. From the dizzying success and tragic losses of 19th century “music hall clown” Georgie Parr, to Michael ‘Mickey’ Braithwaite battling his “difficulties” to volunteer in World War II’s Observer Corps, to sceptical, shrewd, pier fortune-teller Bella Kaminska in 1965, to truth-seeking 1980s archivist Colin Draper, to, almost bringing us a full circle, modern day comedian Sammy Samuels. Each is captured with infinite compassion, so that their private melancholies, even acerbic Sammy Samuels’ can’t help but move you. Robert Lock has equipped dos characters with voices that fit them exactly (better than their clothes, in most cases), so that slipping from one century or decade to another deposits you so firmly in the next life as observed by the starlings that you’ll be absorbed at once. The town and its pier are like a place of limbo, set somewhere between life and death where only some are lucky enough to escape and spread the myths of its hyperreality..
And yet even Sammy Samuels, with his chapters set in ‘Today’, feels like a character dragging his feet through an already obsolete yesterday. The pier is out of time, and perhaps out of magic too. Lock has conjured up a fascinating jigsaw puzzle of a debut, full of the shifting sands, scents and sounds of the British seaside, and of human spirit. 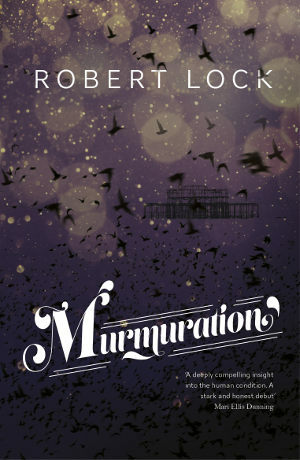 Murmuration by Robert Lock is published by Legend Press and available to buy from Amazon. This entry was posted in Reviews and tagged blog tours, Book reviews, Legend Books, Murmuration, Robert Lock by Judy. Bookmark the permalink.